Well, the Scorpion writers certainly know how to make all their shippers happy in a two-for-one special. I did not expect that, and it left me giddy! Before going into the shipping stuff, there was, of course, the case of the week. The show delivers a few weeks’ time jump, bringing us to a Scorpion team that is functioning without Paige, who has been replaced by (the severely less competent) Ray. I personally love Ray. He’s quirky and hilarious and just so much fun to have around. But he is everything that Team Scorpion is not — and not in the good way. It’s is the day of Toby and Happy’s wedding, and the team are doing final preparations, which includes Toby trying to lose weight in a few hours to fit into his tux. Paige arrives for wedding business and things are apparently not that great between the team and Paige. After Walter fired her, Paige distanced herself not just from him, but also from everyone else. They have not taken it well. Paige cannot be blamed for her actions, though. Walter firing her was heartbreaking and it makes sense that she would keep her distance — and for the record, I cannot really blame him for his actions, either. It was all too painful and emotional for him, too. But the rest of the team is justified in feeling hurt. They felt that Paige abandoned them, not as a team member or colleague, but as a friend. She has managed to break all these geniuses’ hard shells and then she left them all of the sudden, at a very difficult time. Like most episodes, this focuses so much on family and how the team is not just a company, but a family. The pain that everyone felt from Paige’s firing is so strong and so much more impactful because they are a family. With their wedding and their guests waiting for them in San Jose, the team find themselves flying to Wyoming to help stop fires that have erupted underground and are spreading quickly. Not to get too much into the science and engineering of the team’s solution, but it did involve balloons and Fruity Moons. Sometimes the science on this show is just absolutely ridiculous, but that is what makes it the fun show that it is. But as simple as that sounds, it wouldn’t be a Scorpion episode if things didn’t escalate. After stopping one of the fires, another erupts, and the second one is not stoppable with the Fruity Moons trick; it requires a little bit more science. The team needs to create a charge and transform sand to glass to stop the spread of the fire — and that requires Cabe and Walter to go into one of the tunnels. And the longer this takes, the less likely the wedding will happen, especially when Walter gets pinned down and caved in after they get the electric charge to work. Walter is willing to sacrifice himself, asking his friends to leave him so that they can make the wedding. But this is a family. And family comes first. Suffice it to say, the wedding is canceled. 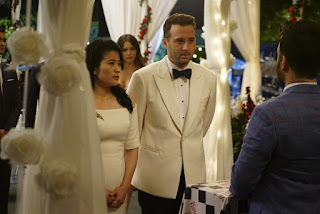 But the team forget they have Paige with them and, just like the geniuses are always coming up with makeshift engineering and science to save the day, Paige comes up with a makeshift wedding to save the day and apologize to the team. The wedding is not perfect, not even close, at least not on paper. It is a tent in Kavelsky’s parking lot, with a Bar Mitzvah cake and Ray as the officiant marrying the happy couple. But in all the ways that matter, it is the perfect wedding. Cabe walks Happy down the aisle, and she and Toby marry, surrounded by the people who matter the most to them. Their team. Their family. Toby gets tongue-tied at the altar, and Happy, for once, has the perfect vows. But that is not where it ended. At the beginning of the episode, Ralph confronts Walter and the young man is very clear and very forward: He is pissed at Walter for hurting his mother, and he calls him a coward for not dealing with his feelings for Paige properly. At the wedding, they have another talk and Walter asks Paige to dance with him afterward. And after three years, it finally happens! Walter tells Paige that he loves her — that he has been in love with her since almost the day he met her. And to his shock, she says that she loves him too. But of course, because this is Walter, he does not know what to do with this information. Luckily, Paige does and the couple finds a storage closet to make out in. Only they get caught. Not by one person, but by the whole team! After a long and exhausting journey, these two are finally at the right place and this should make for a very exciting new journey moving forward.